Fifa president Sepp Blatter has urged women footballers to wear skimpier kits to increase the popularity of the women's game. 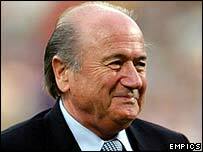 But Blatter's comments have outraged leading European women players, who have said his remarks could further undermine their sport. "Let the women play in more feminine clothes like they do in volleyball," said the Fifa chief. "They could, for example, have tighter shorts." Blatter added: "Female players are pretty, if you excuse me for saying so, and they already have some different rules to men - such as playing with a lighter ball. Pauline Cope, the England and Charlton goalkeeper, said Blatter's comments were "typical of a bloke". "He doesn't know what he is talking about," she said. "We don't use a lighter ball for one thing, and to say we should play football in hotpants is plain ridiculous. Fulham manager Marieanne Spacey said Blatter's view were harmful. "Surely it's about skill and tactical ability first and how people look second," she said. "Ten years ago we did play in tighter shorts. Nobody paid attention then."